One of the best true cashback cards is the American Express Fidelity Investment Rewards Credit Card which offers an unlimited 2% cash back on all purchases with no annual fee. 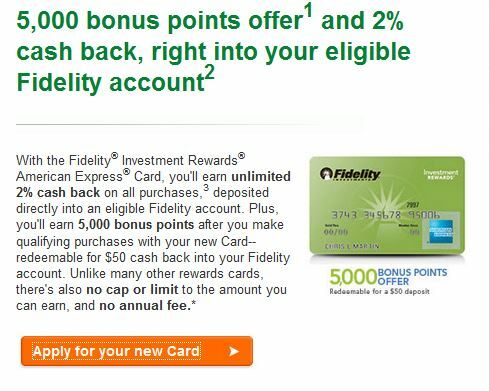 Generally this card doesn’t offer a signup bonus (or at least one I can find on the Fidelity website) but my wife just received an email with a link to apply for this card with a 5,000 point signup bonus after spending $500 in the first 60 days. The 5,000 point signup bonus is worth $50 and since this card rarely offers a signup bonus, this is a good opportunity to apply for this card if you want a true cashback card. In fact, if you click the link for this card on the Fidelity website it doesn’t show you this offer. Here is the link to apply for this card with a 5,000 signup bonus. Using this card as a baseline, you should be earning at least 2% off on every single purchase you make that can be charged to a credit card. Personally I prefer to collect miles instead of cashback but for those out there that don’t want a travel rewards credit card, this is the best cashback card I am aware of as there is no annual fee unlike some other 2% cashback cards. You don’t get 2% off by using cash or a debit card so if you are still using cash or a debit card, STOP and switch to this card. There is literally no cost to this card (except for foreign transaction fees, so don’t use this outside the US) and all the cashback proceeds get directly deposited into your Fidelity account (which is free to signup for), and funds can easily be transferred to your bank account. Again, I want to stress this card is great for people who want to earn cashback and don’t have any desire to collect points or miles. Using a cashback card will not help you fly internationally or in preimum cabins but could work for you if you fly cheap, domestic tickets. I’m highlighting this offer because it is rare to see a signup bonus on a 2% cashback card that has no annual fee (the new Citi Double Dip card also offers 2% cashback with no annual no fee but that has no signup bonus).